From today, visitors to Bishop Auckland will be able to delve into the past, present and future of the historic town with the help of volunteers from the Auckland Castle Trust. 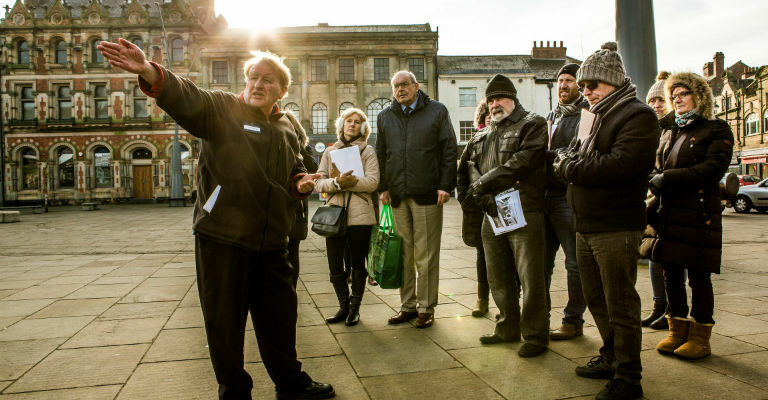 The new weekly tours – which are completely free to attend – will be taking in the sights of the town, which is one of the oldest in County Durham. The route takes in a number of landmarks around the town, including the iconic French Gothic-style Town Hall, St. Anne’s Church (where a place of worship has stood since the 12th Century) and the Robinson Arch just outside Auckland Castle. The site of the former Doggart’s department store, which opened in 1895, and a number of historic locations that have been acquired by the Auckland Castle Trust as part of its plans to revitalise the town. Tours are departing from No.42, at Bishop Auckland Market Place every Thursday at 12.30pm, Friday at 2pm and Saturday at 11am, starting from today (23rd March 2017). Attendance is free and there’s no need to book, just turn up on the day. For more information, visit the Auckland Castle website.